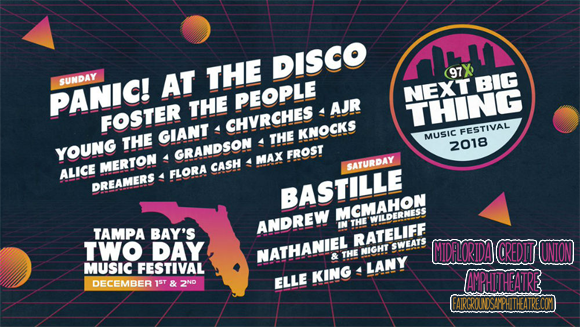 You can always count on Tampa's freshest radio station, 97X, to bring you the very best in alternative music and with this year's annual Next Big Thing weekender, they're outdoing themselves! Not content with rockin' the airwaves, the station's yearly festival is bringing some of the biggest names in indie and alternative to rock you IRL, and this year's Sunday line-up looks seriously fresh, with the eclectic and energetic mix of Panic! At the Disco, Foster the People, Young The Giant, Chvrches, AJR, Alice Merton, Grandson, The Knocks, Dreamers, Flora Cash and Max Frost taking to the stage! Not to mention there'll be loads of stalls and food vendors to keep you satisfied throughout the weekend, plus the very exciting reveal of the Next Big Thing Live Competition Grand Prize winners! In its eighteenth year, 97X's Next Big Thing festival is still very much the place to be for all alternative music lovers! Don't delay, book your Sunday admission tickets now and head on down to MidFlorida Credit Union Amphitheatre on Sunday 2nd December 2018!